(Nanowerk News) Cancer stem cells are resistant to chemotherapy and consequently tend to remain in the body even after a course of treatment has finished, where they can often trigger cancer recurrence or metastasis. A new study by researchers from the A*STAR Institute of Bioengineering and Nanotechnology has found that using nanoparticles to deliver an anti-cancer drug that simultaneously kills cancer cells and cancer stem cells significantly reduces the recurrence and metastasis of lung cancer. The drug phenformin is very effective against cancer stem cells. It is related to the popular anti-diabetic drug metformin but is 50 times more potent against cancer cell lines. However, phenformin is too toxic in its free form to be administered to patients at the doses required to kill both normal cancer cells and cancer stem cells. Now, Yi Yan Yang and her colleagues at the Institute of Bioengineering and Nanotechnology in Singapore have found a way to overcome this problem — using self-assembling polymer nanoparticles to deliver the drug ("Phenformin-loaded polymeric micelles for targeting both cancer cells and cancer stem cells in vitro and in vivo"). In the first study to use polymer nanoparticles to deliver phenformin to target both cancer cells and cancer stem cells, Yang and co-workers found that phenformin-loaded nanoparticles targeted both kinds of cancer cells in a mouse model of human lung cancer. This delivery method enabled Yang and her team to arrest the growth of cancer and cancer stem cells when the nanoparticles were delivered to implanted human lung cancer in mice. “The results showed that the phenformin-loaded nanoparticles were more effective than free phenformin in inhibiting the growth of both cancer stem cells and normal cancer cells,” Yang says. Moreover, the nanoparticles did not induce the liver toxicity observed in systemically administered phenformin. The method can also be extended to other drugs. The team has used the nanoparticle-based delivery system in a mouse model of human breast cancer to deliver the anti-cancer drug, doxorubicin — another drug that is toxic at certain doses but is capable of killing cancer stem cells. “The combination shrank tumors by more than 40 per cent and was more effective than treatment with either drug alone,” says Yang. The team is now seeking to collaborate with pharmaceutical companies to bring this technology to human clinical trials. 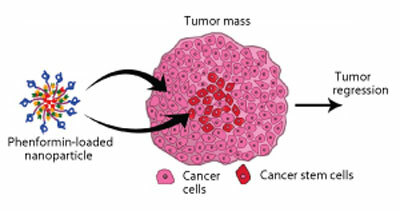 Yet another example from the labs to demonstrate a way for nanotechnology to kill cancer cells.